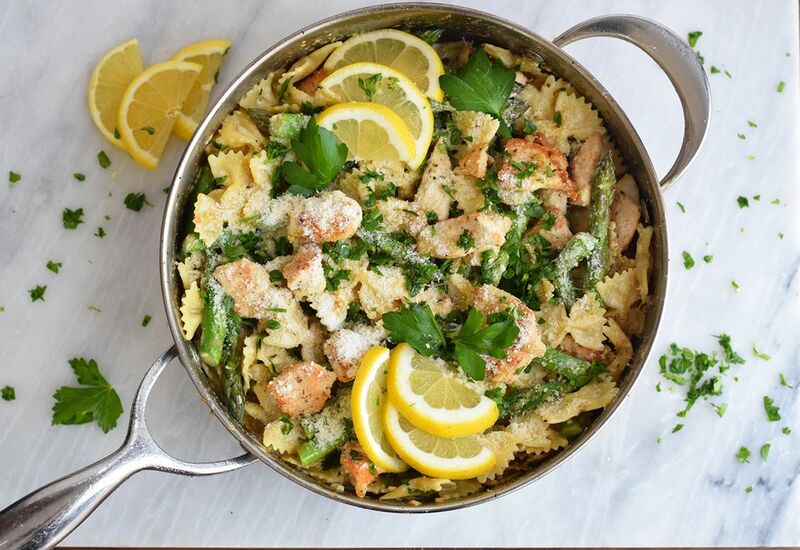 Lemon, asparagus, and chicken are simple ingredients that combine into something truly special when served on top of pasta. This healthy dish is perfect for spring, when asparagus is in peak season. The recipe does call for cream cheese, but just enough to create a lightly creamy sauce that clings to the pasta. Garlic, parmesan cheese, and just a sprinkle of shredded mozzarella elevate this dish to plate-licking status, and parsley and lemon add a pop of brightness and acid to create a perfectly balanced bite. It gets even better: this whole meal is made in one pan! Aside from boiling the pasta, you'll use one large sauté pan to cook the chicken, asparagus, and sauce. Bring the pan right to the table for an easy weeknight meal (with equally easy clean-up) that you can have on the table in less than 30 minutes. Cook your pasta according to package directions. Reserve 1 1/2 cups of the cooking water just before you drain the pasta. Season the chicken with about a teaspoon each of salt and pepper. Heat your olive oil in a sauté pan on medium high heat and add the chicken. Spread out the chicken so that the pieces are not overlapping. You may need to do this step in two batches, depending on the size of your pan. Cook until browned on both sides. Toss in the oregano, stir well to distribute evenly, then remove the chicken from the pan and set aside. Use the same pan to cook the asparagus. Add the minced garlic and asparagus. Sauté for about 2 minutes over medium-high heat, or until the asparagus is bright green but still firm and snappy. Remove the asparagus from the pan and set aside. Add the reserved pasta water, chicken bouillon, lemon juice, and lemon zest to the pan. Bring to a simmer, then then whisk in the mozzarella, cream cheese, and parmesan cheese until the cheeses are melted and incorporated into the sauce. If you are adding heavy cream, add it now. Add the cooked chicken, asparagus, cooked pasta back into the pan, add chopped parsley, and toss with the sauce. Add lemon slices and more parsley just before serving. Garnish with extra parmesan cheese and dig in! This pasta reheats really well. Just add a little cream or whole milk to a pan, heat it until simmering, then add in the leftover pasta and toss until coated and warmed through. Make sure to use fresh lemon juice, not the bottled kind — the flavor really makes a different. Use any kind of pasta you like. A short pasta that holds sauce well works best. Try rigatoni, medium shells, or rotelle.